Snack Girl has been fortunate to visit Turkey twice in her 43 years. Both trips taught me so much, and I remember them vividly. My memory of Turkey is so good because my brain was AWAKE for it. Every morning, I was served something like the above photograph. The photo above is my Massachusetts representation of a Turkish breakfast - I forgot the olives, hard boiled (or soft boiled) egg, and the yogurt, honey, butter, and jam (perhaps my memory isn't so good after all). 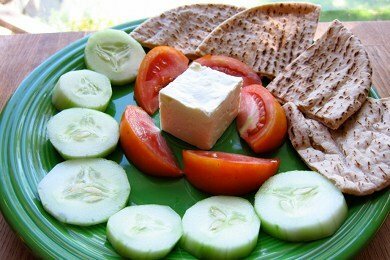 What I DID remember was the feta-like cheese, cucumbers, tomatoes, and bread because I loved this combination. Many breakfasts in Turkey were served buffet style so I could make my own selections and this was what I chose. Well, I couldn't quite believe I was having cucumbers and tomatoes for breakfast!! Why hadn't I been served this before? I happen to love both of these fruits (sometimes called vegetables). This is so ridiculously simple and refreshing as a snack, breakfast, lunch, or even dinner (change portion sizes accordingly). The saltiness of the cheese plays off the sweetness of the fruits. The preparation time is just a bit more than pouring your milk into your cereal and it feels so luxurious to have 4 different foods on your plate. Give me my java and this plate and I am in heaven (and I don't get hungry before lunch). The sodium is a bit high here because of the saltiness of the cheese. If you are watching your sodium - eat less cheese and add a soft or hard boiled egg. Put on plate and enjoy! Great post, and good reminder for me! I dated a Turkish man several years ago and this is exactly what he ate for breakfast every day! Love your sugestions - I'll have to try this one. I love this kind of meal, simple and easy!! Great breakfast and if you replace the cheese with some hummus and its vegan. Similiar breakfast in Israel. Eastern Europe replaces the pita with a hard roll, and feta for salami. Not quite as healthy, but ohhh so good. Cukes and Tomatoes have become a regular breakfast item for me. We spent 5 days in Turkey for our honeymoon and I remember loving these breakfasts! I really liked the assortment of cheeses and olives they would have out, too. It's very similar to half a bagel (or bagel thin) with a shmear of cream cheese or some fresh mozzarella, garden fresh tomato and a bit of red onion (for that crunch with a touch of zing)! My kind of snack! Will have to try to breakfast; however, I have tomatoes often for breakfast. Ever had tomato and scrambled egg? Yum-o! I can't believe you are 43!!! First time I went to Belgium I was given a tomato omelet -- never forgot it. Who needs meat for dinner? and of course....sweet tea to drink with any of the above! With all these great choices don't think I will be eating cereal again. I love learning about other cultures and what they eat for meals. When I was in Ecuador, our standard breakfast was white bread and butter, jelly if we were lucky, a slice of cheese if we were really lucky. Needless to say most of the Americans started bringing our own peanut butter. I've just been getting bored with my breakfast options lately and this is really perking me up! I would so love to visit Turkey one day, mostly for the food :) This looks terrific and love the idea to add nuts, honey, hard-boiled egg etc. I wonder if my toddler would go for it...she does enjoy all of these foods. Thanks for the idea as always! I'm also from Iran and remember the delicious breakfast every morning as a child. Halva (although not low-cal) was also a staple, rolled up in lavash bread. Thank you Snack Girl for this post. I have a very hard time eating American traditional breakfast food in the morning, I always end up getting sick. Ever since I was a kid I'd rather have leftover dinner from the night before for breakfast. This dish is so delicious you had my mouth watering. And completely simple. My only question is why didn't I think of doing this myself? Seems so obvious. Guess what I'm having for breakfast tomorrow? Thank you again!!! Love your site. I love this type of food, but I never thought of eating this way for breakfast. I think I am going to try it with yogurt instead of feta. Yes, yes, yes! I just got back from Bulgaria and this was my daily breakfast. Eastern Europe knows how to make a good breakfast. Filling with good carbs and protein, this breakfast is the best! Great idea! Thanks for sharing that. I would probably like to add a touch of sweetness to the mix on occasion, with a sliced peach in summer, and maybe some fig or apricot jam. Well had a small whole wheat roll with cucumber, sliced plum tomato, eggplant hummus, sliced olives and shaved parmesan & romano cheese. Loved it! Thanks again for the idea. Thank you! Now I know what I'm having for breakfast tomorrow, and I have all these ingredients in my kitchen! Guys,, check out other Turkish breakfasts here. Another great idea, thanks! I also love tomato, spinach and a soft boiled egg on Ezekiel toast, drizzled with olive oil! I'll try feta and cucumbers tomorrow! I going to Turkey in September and now I'm really looking forward to breakfast! !